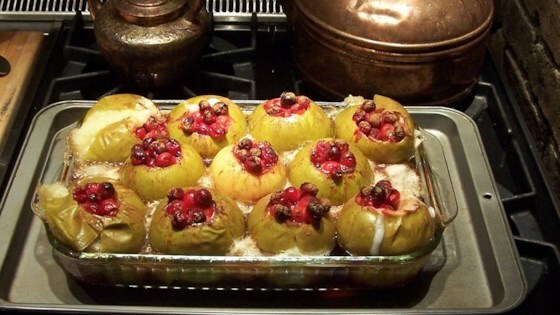 "These baked apples are stuffed with cranberries and glazed with a mixture of honey and brown sugar for an extra-special treat that makes the house smell great too!" Core the apples, and remove the peel from the top third of each one. Place them in a baking dish, and fill the core holes with as many cranberries as you can fit. Meanwhile, stir together the water, brown sugar and honey in a small saucepan. Bring to a boil, stirring occasionally to dissolve the sugar and honey if necessary. Once it comes to a boil, pour the mixture over the apples. Bake for 1 hour in the preheated oven, basting with the juices every 15 to 20 minutes. Serve with vanilla ice cream. Juicy fall fruit full of wholesome oats! so simple and so delicious. my teenagers just love these! i add 1 teaspoon of vanilla to the water mixture and sprinkle each apple with a dash of cinnamon. we top them with whipped cream. These were so easy to make and absolutely delicious! My family has asked me to make these again soon! The only addition I made was to sprinkle cinnamon to the tops before baking. Wonderful!! GREAT RECIPE THE ONLY ADDITION I MADE WAS TO ADD APPLE JUICE INSTEAD OF WATER ON THE BOTTOM AND TO SPRINKLE WITH CINNAMON!